It seemed at the time very random to go through all the hassle of putting together the well-deserved tribute to Bromige since it was neither a round-numbered anniversary of his death (in 2009) or his birth (in 1933) or even the publication of his first collection of poetry (in 1965). But I knew by agreeing to the assignment I would also be able to get to the bottom of “why” mystery. I did manage to make it in time to downtown Petaluma to catch my editor’s reading and we were able walk up together to the Phoenix Theater, the site of the tribute. Who should we run into but Tom Sharp who had been the Poet Boy Wonder of Petaluma High School while I held a similar position at nearby Rancho Cotate High School when Bromige embarked on his tenure track. 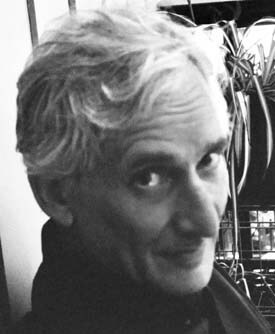 Sharp would go on to hold significant editorial authority over the student literary publications of Sonoma State College (it was not yet a university) where David Bromige, not yet 40 years old, had come to teach and to purloin a Gestetner mimeograph machine for the students to publish their literary magazine. It was good to see Tom again. He and I both remembered the venue as the “California Theater” where we had both seen the same first run of The Beatles’ “Yellow Submarine” as early teens. I was also able to quickly solve the “why” mystery. Just prior to the event, I learned through a reliable source that the tribute had been planned as a launch of the long-anticipated edition of a collected poems of David Bromige, an edition underway at the upper echelons of the language poetry combine but which by the time of that particular Petaluma Poetry Festival had not yet materialized. With no book to launch, the organizers chose to go forward, since some of the participants, notably Richard Denner, had arrived from distant places at considerable personal expense, and simply bill the event as a tribute. It seems to me it would have been more compelling, if corny, to hold it as a Fluxus-style “happening”—a book launch with an imaginary book—with all the British satirical aplomb that Bromige embodied as a poet. But then, he really would have wanted the book. 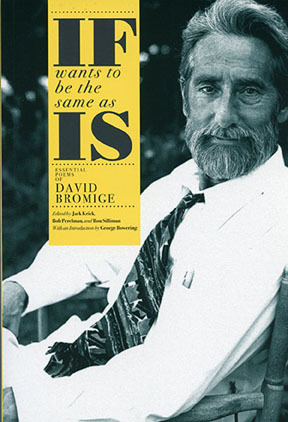 Now that the book, If Wants To Be The Same As Is: Essential Poems of David Bromige. (Bob Perelman, Ron Silliman, Jack Krick, eds. Wiwth Introduction by George Bowering, New Star Books Vancouver, B. C. [Canada]; Point Roberts, Wash. 2018) is here in all its 624-page glory, with a “world tour” [“Always-already: The David Bromige Posthumous World Tour 2018”] to launch it, we can now historicize the random tribute at the Petaluma Poetry Festival as the prelude to the book launch and, I’ll stand by the assertion that “prelude” would suit Bromige, too, obsessed as he was about poetic form and indoctrinated as he doubtless was in the work of both William Wordsworth & T. S. Eliot during his school days at “Habs” (Haberdashers’ Aske’s Hampstead School) in Elstree, Hertfordshire. It turns out that I did not complete my assignment with a report at the time for this blog on the Petaluma tribute, but, as I’ve said, it was great to see Tom Sharp again and I was excited, too, to meet Denner for the first time, after enjoying his poetic antics while he held forth as a denizen of Berkeley’s former Caffè Mediterraneum. Bill Vartnaw, who followed David Bromige by a decade to hold the distinguished title of “Poet Laureate of Sonoma County”, was the evening’s master of ceremonies (the same role he played for “the prelude.”) But he was much more than that this time. Vartnaw was Indiana Jones, revealing to a gasping audience the breath-taking discovery he had recently made in the recesses of the administrative complex of the City of Rohnert Park. . . .after a short correspondence with Darrin Jenkins, Rohnert Park City Manager, he has decided that before we decide on how to act on all the poems, I need to show that I can install Bromige’s poem. This then is the next step. Since my term [as Poet Laureate] is almost up, I plan to continue on with this project after my term is over. Vartnaw found a place (which just so happens to be the place that hosted the book launch) for Bromige’s bronze poem (which just so happens to be the source of the title of the book being launched). 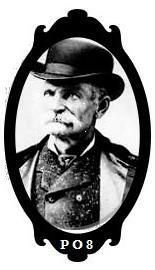 Learning of the existence of “the bronze” led him on a campaign to locate the relic, which was an equally challenging task. He eventually found all the poems that had never been mounted in the 2003 library building, wrapped and stacked, forgotten, in storage in the offices of the Public Works Department of the City of Rohnert Park. As promised, Jenkins handed the Bromige poem over to Vartnaw now that he had a venue for it and here it was, shimmering before us. The challenge now is to come up with the money to install it somewhere at the Sebastopol Center for the Arts. Two objects were being unveiled, the book and the bronze, to cinch immortality for David Bromige. In his presentation, Vartnaw made sure to thank the city worker who led him to the find, whose name he confessed he could not remember. 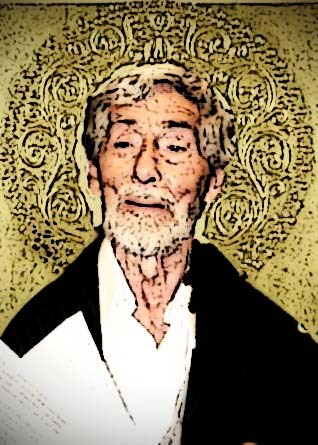 The time had finally come, after Vartnaw’s introduction (which followed a welcome by Cynthi Stefenoni, member of the board of the Sebastopol Center for the Arts), to get to the true source of Bromige’s immortality: his writing, which the distinguished presenters had come to Sebastopol to recognize. Editor John Krick was first of the editors to take the microphone to introduce himself, admitting he was the only person on the stage who’d never met David Bromige. (This could be a significant advantage for an editor venturing into the sometimes contentious arena of avant-garde American poetry, where Bromige became an enduring fixture. at least on this coast.) He read from Harbormaster of Hong Kong, published by Sun & Moon in 1993. Then came Ron Silliman who pointed out that along with much more, Bromige had mastered satire, not an easy task. He told the story publicly of his first experience with Bromige at that reading in Albany and read the poem (“First”) that had most blown his mind 50 years ago. Bob Perelman, who with his partner Francie Shaw had developed a very close friendship with the Bromiges, followed with a reading of selected passages from the prose introduction he contributed to the book (which to fans of David Bromige is about worth the rather hefty ($35) cover price of the rather hefty 624-page volume. Next up: Pat Nolan, who needs no introduction. He shared Vartnaw’s theme of forgetfulness, confessing that he had just “forgot” what he was going to say. (Coincidentally, both he and Vartnaw were the only presenters at this, the “real” launch of Bromige’s collected poems, who had also participated in the “prelude” in Petaluma. Had they both somehow been victimized by some kind of top secret Russian memory-purge technology similar to what the American diplomats were exposed to recently in Cuba?) Forgetfulness aside, Nolan was able to remind us of Bromige’s mellifluous voice, his syntactical wizardry and his lyrical gift as a poet, demonstrated in his reading of “At Last,” a poem from The Gathering, the first collection of Bromige’s work published by an old chum from Vancouver, Fred Wah while he was studying with Charles Olson in Buffalo, N. Y. Nolan followed with a reading of “Logic,” another brilliant work, and grammatical tangle, from the Harbormaster of Hong Kong, ending his turn at the microphone with a recollection of a very particular detail from “the prelude” in Petaluma: a line Richard Denner delivered that day, “life is brief, it says here,” demonstrating that Nolan’s memory is generally fine, no matter what anyone says. We’d also been reminded somewhere in the words from the stage of Bromige’s residual North London accent, which remained well-pronounced despite his many decades of North American residence. We would then hear traces of an altogether different accent when the former Texan and Bromige’s former pedagogical colleague Gillian Conoley took the microphone to read the magnificent “Watchers of the Skies,” a poem included in Desire, the selected poems from Black Sparrow Press in 1988. Her reading of the poem was as magnificent as the work itself, bringing strong hints of the tender feeling she had for her former colleague at the university. Conoley was followed by another campus colleague, Jonah Raskin, who had very intimate memories of conversations he had with Bromige while riding the campus elevators up and down to and from office hours and classrooms. The presenters, taken together, recalled to me what I most admired about Bromige: the appreciation he possessed and the acceptance he could muster for the entire range of contemporary poetic expression, without judging the talent or skills of the poet or the value of the work beyond its most basic element, whether it “works” as a poem. He instilled in me the value of keeping that core question in mind whenever I attempt to make a poem out of whatever I’m dealing with language-wise. The North Bay-native Cole Swensen would bring the program to intermission, making sure, by reading “The Nest,” to include a poem from Birds of the west, the 1973 book from Coach House Press which remains to me one of the most profoundly beautiful works of late 20th-century poetry written in English. And speaking of “working” (as a poem), that volume alone could work to guarantee Bromige literary immortality as far as I’m concerned. Another North Bay stalwart, Petaluma photographer James Garrahan would end the intermission with an almost apologetic introduction to his 53-minute “Incremental Windows,” an exquisitely edited and sensitively videographed documentary of Bromige expounding and improvising around his Sebastopol home during his later years. The 53 minutes pass quickly as the viewer is drenched in rapture with the brilliant wit, linguistic mastery and joy that Bromige could imbue upon his surroundings and his companions. The launch was repeated the following evening at Alley Cat Books in San Francisco, with a much larger but equally distinguished cast of presenters, featuring fellow Londoner Opal L. Nations, another of Bromige’s closest friends in California. I couldn’t make that event, despite the great temptation it presented to the compulsive and unrepentant name-dropper that I’ve become. Had I attended, I may have been clued into the scale of the tribute I first saw rehearsed that sunny afternoon in my old stomping grounds of Petaluma, not far from the bridge over the river that the infamous Dolcini Brothers liked to throw us “rockers” into when we weren’t looking. I thought I had learned from those days to pay better attention. Alas, here I was with old friends paying tribute to another old friend, with no inkling of the magnitude of the encomia this book has enkindled. And to think that My Poetry, the book that Bromige thought was his most important work, appeared from Geoffrey Young’s The Figures in 1980 in an edition of only 650 copies, not nearly enough to spread around the world. 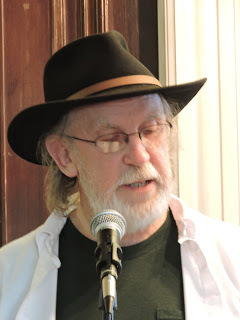 Steven Lavoie was co-editor of the scurrilous Life Of Crime, Newsletter of The Black Bart Poetry Society, and the equally notorious schismatic Life Of Crime-In-Exile in the mid 1980’s. He is currently employed by the City of Oakland, as branch manager of the Temescal Branch Library. As society columnist for Parole he has previously reported on the Frank O’Hara Marathon reading of 2015, the Actualist Movement’s dispersal to the San Francisco Bay Area, and on the Joanne Kyger Memorial in Bolinas in 2017. This entry was posted in Poetry, Poetry Society and tagged Allan Kornblum, Andrei Codrescu, Bill Vartnaw, Black Bart, Bob Perelman, California, California Poetry, Cinda Kornblum, Coffee House Press, Cole Swensen, Dave Morice, David Bromige, Ezra Pound, Gillian Conoley, If Wants To Be The Same As Is, James Garrahan, John Krick, Jonah Raskin, Life Of Crime News Letter, Modern Poetry, Morty Sklar, Petaluma, Poetry, Poetry Blogs, Poetry Lectures, Poetry Lessons, Poetry Society, Poetry Talks, Poets, Richard Denner, Ron Silliman, Schools of Poetry, Sebastopol, Sebastopol Center For The Arts, Steven Lavoie, The New Black Bart Poetry Society, The Spirit that Moves Us Press, The Ultimate Actualist Convention. Bookmark the permalink. 2 Responses to Bromige Immortalized! Lovely to read all this, and still sad that I had to miss “The Bronze” and “The Book” event, I love that this catches the heart of David’s intelligence and kindness: “the appreciation he possessed and the acceptance he could muster . . .” I love that statement, because if you were to put the intelligence and perceptiveness and mastery of David Bromige behind a character without that heart, then we would not love him so.